For the second year in a row, Kamus + Keller has moved up the Los Angeles Business Journal’s prestigious ranking of the top Commercial Interior Design Firms in the LA area. 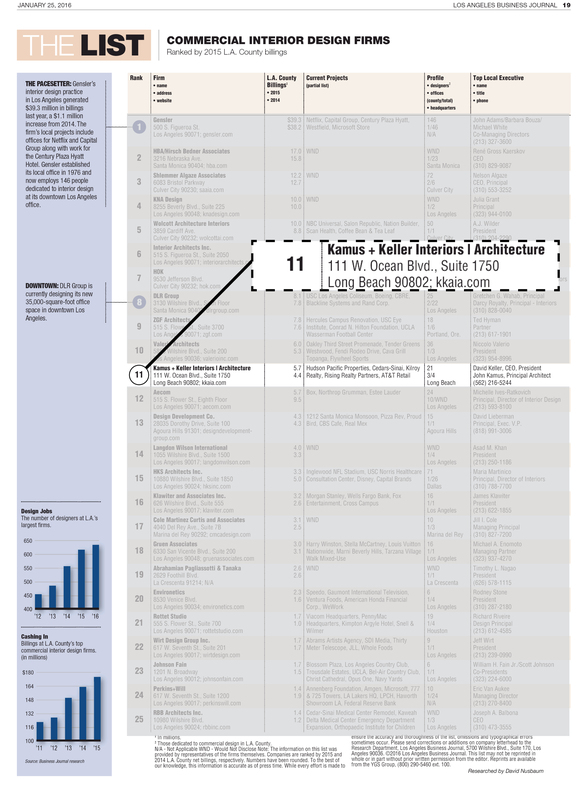 Bumping up 2 spots from 2015, Kamus + Keller is now at #11, in close company with such design giants as HOK, IA and DLR Group. LABJ’s series of annual lists has long been a respected indicator of industry and economic growth, as well as putting a spotlight on the best of local business. Visit LABJ’s website for the full list, as well as up-to-date news on all things Los Angeles.